Got a picky Mum? A lady for whom a Superdrug giftset just won’t do? No, me neither (thank God!) but if you do… here’s some prime picks that might settle the hunger in her belly! 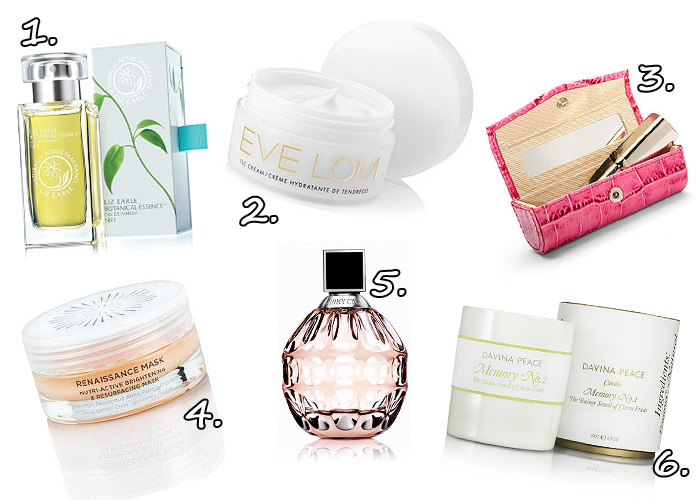 The best Mother’s Day Gifts for between £30 – £50! For our first ever fragrance we’ve used the finest natural botanical ingredients from around the world and the expert skills of a distinguished perfumer from Grasse, France. We gave him the time to indulge in the age-old art of perfumery, skilfully hand-crafting this complex scent with true passion to create this vibrant, sparkling fragrance translating into warmth and sensuality. This sensuous fragrance can be worn every day. Well, let’s just be honest here… it’s Liz Earle meets perfume innit. If your Mum is like most Mums out there, she’ll fall over herself to rip the carefully chosen wrapping paper off this one. This intensive cream gives tender, loving care to dry and very dry skins types and is ideal for more mature complexions. The most luxurious of all rose oils, Rose Otto of Bulgaria gently softens lines and wrinkles and imparts a delicious aroma. A very rich cream that is ideal as an overnight treatment for softening and reinvigorating the tightest of skin types. To put it simply, go to bed with tight, aggravated skin and wake up with supple and hydrated skin. It’s very thick but warms up well and absorbs effectively through the night. Mostly? I love the rose scent. It’s a comfort cream for poorly skins. Protect your favourite lipstick in style with this lipstick case handmade in gorgeous mock croc calf leather and lined in shimmering grosgrain. Designed to hold one lipstick, the case closes securely with a popper fastening and even has a small handy mirror. Squee cute much? If pink ain’t your *cough* Mum’s thing, it’s available in a host of other colours too! Designed to increase cell turnover, boost radiance and packed with OSKIA’s trademark blend of beauty-boosting nutrients, this luxuriously-textured exfoliating mask leaves the complexion smoother, more refined and illuminated. Our testing panel thought its natural perfume so delicious they wanted to eat it! Oskia have a great reputation for their “nutritionally-designed, natural skincare range” which is all about supplying the skin with a ‘diet’ of skincare goodies that include vitamins, minerals, amino acids and glucides. If your Mum is a lover of oraganic, natural products, then you won’t go far wrong with Oskia who are proud of their ECOCERT credentials. The Renaissance Mask promises to be a real treat, providing instant results and rinsing tired skin down the plughole to reveal a fresher you! Femininity, luxury and style… bottled. Green top notes give a burst of freshness, a heart of Tiger Orchid lends a creamy seductiveness, and sensual base notes of toffee and Indonesian patchouli. A modern fruity-chypre. The best things come to those who wait and the base notes contained in the EDP are lovely. Despite it’s base of toffee, it manages to be sweet without being cloying… they describe it as ‘creamy’ which is pretty much spot-on. Perhaps a choice for the younger Mums out there *waves arms*. Jimmy Choo’s inaugural fragrance is proving popular. Each Davina Peace candle is inspired by a long-lasting memory of the brand’s eponymous founder. Based on the balmy smell of citrus fruits, this candle blends the organic fragrances of Sicilian lemon peel, juicy orange, Italian bergamot and root ginger. Dedicated to only sourcing organic ingredients where possible, Davina Peace uses only pure natural wax blended with an organic fragrance in her candles. Nothing is more exquisitely shared between mothers and daughters than memories and Davina Peace pays tribute to the art of remembering with the fragrances she offers throughout her range. Her Memory No. 2: Citrus Fruits candle is a perfect choice for the warmer Summer months that are hopefully beginning to open up before us! Hope that gives you a little inspiration for lovely Mums everywhere! £35 for a lipstick case?! Oh my. I bought my mum’s mother’s day present in December in the sale hehe. £45 worth of The Body Shop products for just £14; score!